Purchase the SEDER Tool Kit to bring this micro-grant project to your local community. Bring Nu ART staff to your community to train your organization regarding how to launch this project. This includes phone consultations, customizable SEDER logo, the SEDER Tool Kit, and a Nu ART's professional at your first SEDER event. To purchase the SEDER Tool Kit or to discuss consulting fee please click here to contact Nu ART's staff. $2,000 Sponsor one 6-Week Exhibition. This gift will include the ability for Nu ART's professionals to create quality educational programming with each exhibition. Bring the Nu ART Mobile to your community, organization, or event. Cost of programming is on a sliding scale depending on fiscal resources. We will work with non-profits and Jewish educational settings to create high impact programs. We do not want costs to be a barrier to the public experiencing the Nu ART Mobile. 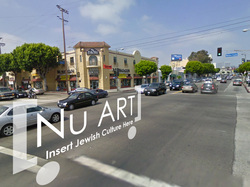 Click here to donate time, services, or resources to help bring Nu ART to a street near you!